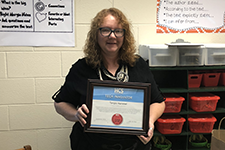 The HCS Tech Innovator of the Month award is an award given to teachers for the innovative use of educational technology in classrooms. 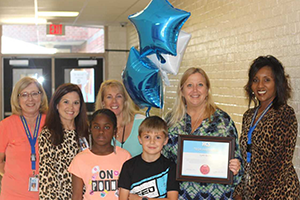 Recipients are recognized each month at the Elementary, Middle and High school level and are pioneers of new learning strategies and educational technology in their classrooms. They embrace Personalized Learning as an instructional model that allows them to better differentiate learning for their students.These educators embody a growth mindset and believe their students can accomplish great things with technology in their classroom. We are proud to recognize these educators who personalize learning through innovative teaching! Congratulations! Mallory uses technology in innovative ways to engage her students and support their academic growth. She is always willing to share and support the growth of others in the classroom and through personalized learning, Mallory reaches all learners. Jennifer has been instrumental in promoting coding across the school and hosts several after-school clubs on technology and code. She is a master of “all things Sphero,” and continues to be a wonderful advocate for computational thinking across course work. 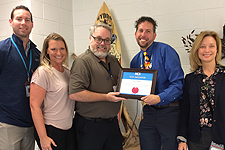 Jeffrey has revealed himself as an exemplary PLTW teacher that incorporates various technologies within his lessons. Jeffrey has also developed entire Minecraft worlds dedicated to the study of electric circuits! Amy strives to provide meaningful and authentic learning experiences for her 1st grade “squirrels.” Ms. Saunders projects her growth mindset on her students who are always willing to try new things using technology! Faleshia Dozier is always willing to learn and has made some great achievements with Computational Thinking and Minecraft in her classroom. She loves to share with her students and is always open to trying new things! Ami-Lyn utilized the Sphero robots in her classes this year and taught teachers all over the district how to integrate coding into their classrooms too! Jessica Sanborn always embraces new and creative ways to use technology in her classroom. She is a leader in her school and is always willing to share ideas and help her students and others learn new tools. She has embraced helping her students become computational thinkers through the use of coding apps/tools. Marie Girolamo is always eager to explore and utilize new technology to enhance the learning of her students. The library learning commons at SMS has become a space where all students feel welcome to create, learn, and inspire as they are consistently provided opportunities for growth. Bianca does a tremendous job offering students creative opportunities to learn with technology and fostering computational thinking with coding in her classroom along with helping her peers become familiar with coding tools. Traci has helped turn her learning commons into a hands-on, creative space with the use of Makerspaces, virtual reality, and coding tools! Along with being an excellent teacher, Rebecca mentors other teachers in regards to personalized learning. 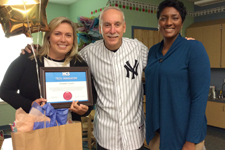 She always plays a critical role in Myrtle Beach Middle’s Genius Hour. Thomas takes art class to the next level by incorporating innovative technologies for students to experience and grow. Mr. Bennett is a huge advocate for digital portfolios and provides his students with several opportunities to be creative and reflect on their learning process. Kandis provides engaging experiences for students and is a leader in her grade level, but also within the school. Ms. Tucker strives to personalize learning for students using technology. Elizabeth creates opportunities for student ownership through digital integration and opens her classrooms to other educators to share best practices. Caitlyn strives to use technology to inspire and engage not only her students but other teachers at AMS and throughout the district with student ownership as her focus. Rebecca is always using technology to engage and inspire students to read. She actively models and shares her ideas with teachers and other HCS Media Specialists. Jennifer always demonstrates a growth mindset and her passion to reach all children has no limits. She is a pioneer with Blended Learning at her building and is always willing to learn, share and experiment. Evan is always eager to collaborate on interdisciplinary projects and his students were recently involved in a Mapathon using open source mapping. Ms. Quinn is a special education teacher at St. James Elementary. She makes every effort to provide innovative experiences for all students with the use of digital devices. Tangie Hammel is a Social Studies teacher at Conway Middle School. She does amazing things with digital notebooking tool for her students and she is always willing to help her peers. Towanda McClary, of Myrtle Beach High, constantly pushes her students to create and design within her Google Apps courses. Ms. McClary also presents PD throughout the summer on ways to incorporate coding into the HS classroom.